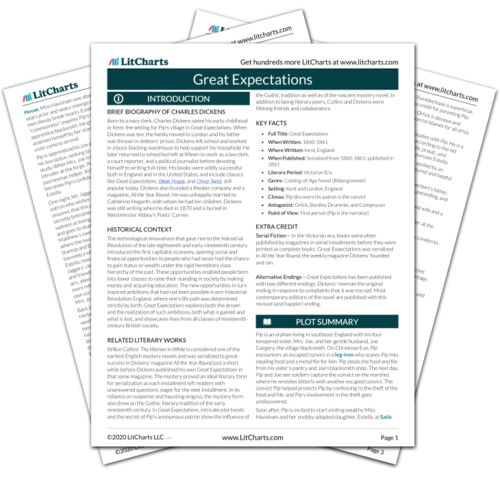 Instant downloads of all 945 LitChart PDFs (including Great Expectations). Determined to be "uncommon," Pip decides a few days later to achieve his goal by becoming educated and asks Biddy to teach him all she knows. Biddy agrees. Still, Pip struggles amidst the hectic squalor at the evening school, where resources are scarce (the whole class shares a single textbook), the teacher is disengaged, and students are combative. Pip sees education as a means to self-improvement, a way to rise in class. This notion of class mobility is a legacy of the new social system created by the Industrial Revolution. Previously, the class system was entirely determined by birth. Though Pip's experience at school indicates just how poor Victorian England's working class schools were. After school, Pip goes to meet Joe at the village public house, the Three Jolly Bargeman. He finds Joe with Mr. Wopsle and a stranger. The stranger is "secret-looking" and looks hard at Pip, nodding. He eagerly asks about Pip and stirs his drink with a metal file that only Pip can see. Pip realizes in shock that the stranger must be connected to the convict he helped years ago. In parting, the stranger gives Pip a shilling wrapped in paper which, back at home, Mrs. Joe sees is two pound notes. Joe runs back to return the money but the man is gone. Pip worries that it is common to associate with convicts and has nightmares about the metal file. That the stranger shows Pip a metal file and then gives him money suggests that the stranger has been sent by the convict himself, perhaps to give Pip the money in thanks for helping him. Pip is now aware of a class system he was ignorant of when he first met the convict on the marshes. He knows that convicts belong to the lowest class and fears association with them might tarnish his own social status. Ross, Margaret. "Great Expectations Book 1, Chapter 10." LitCharts. LitCharts LLC, 16 Sep 2013. Web. 26 Feb 2019. Ross, Margaret. "Great Expectations Book 1, Chapter 10." LitCharts LLC, September 16, 2013. Retrieved February 26, 2019. https://www.litcharts.com/lit/great-expectations/book-1-chapter-10.